Lovely surprise for Sheffield-based St Luke’s as Lifetimer Lambo pops along with hospice cheque! Posted July 29th, 2016 by Andrew Lodge & filed under Community News, News. Posted July 29th, 2016 by Andrew Lodge & filed under Uncategorized. Posted July 28th, 2016 by Andrew Lodge & filed under Community News, News. Lifetime Trainee Financial Planner Luke Worthy was delighted to present Barnsley Hospice with another donation from our referral scheme. 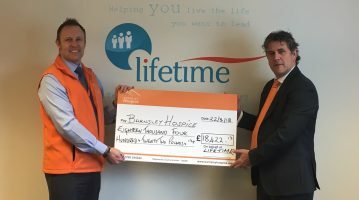 Luke, who has joined Lifetime after graduating from the University of Sheffield, handed over a cheque for £744.77 to hospice fundraiser Samantha Silverwood (see below). 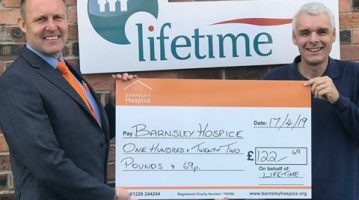 Dodworth-based financial management company Lifetime has built up a very strong relationship with Barnsley Hospice…. Posted July 28th, 2016 by Andrew Lodge & filed under News. Posted July 16th, 2016 by Andrew Lodge & filed under Community News, News. Posted July 7th, 2016 by Andrew Lodge & filed under Community News, News. Posted July 1st, 2016 by Andrew Lodge & filed under Community News, News.